Do you have ancestry in the Waverley and South Head areas? These cemeteries in Sydney’s eastern suburbs began in the 1800’s. Waverley Cemetery had its first internment in 1877 now has now grown to over 80,000 interments in 50,000 gravesites and memorials over 40 acres. South Head General Cemetery had its first internment in 1869 and now has over 6,000 gravesites and memorials in 4 acres. These records are really valuable for anyone searching for ancestors from the Waverley and South Head areas. 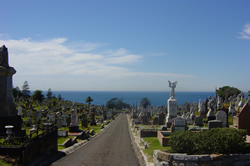 There are a number of people that have been laid to rest in the Waverley Cemetery. From poets and beer brewers, to judges and cricketers, this list is worth a look as there are definitely people from all walks of life! If you're exploring your family history or building a family tree, this is a terrific genealogy tool for anyone with ancestry in the Waverly and South Head area.